Radiotherapy is the treatment of disease with radiation. Doctors use radiotherapy most often to treat certain kinds of cancers. The method of radiotherapy familiar to most people is X-ray treatment. X-ray radiation, however, can only show dense materials such as bone. A better way of diagnosing internal disorders is through the use of radionuclides, or radioactive tracers (isotopes). Radioactive tracers that are introduced into the body by injection are called radiopharmaceuticals. According to the type of radionuclide, the tracer will collect in one or more areas of the body. Since the tracer emits radiation, it is easily tracked by a Geiger counter (a device that measures radioactive levels) or scanning device. Because the tracer sends out information for a long time, doctors can follow its path through the body and check to see if organs are working properly. Radioactive trace elements are a favorite diagnostic tool because they can be used to target individual organs, like the kidney. The trace elements also give off less radiation than a standard x-ray, so they are generally safer to use. Once a radiotherapy diagnosis has been made, the doctor has a choice of treatments. For cancers near the skin surface, a stream of beta particles is used to kill cancerous cells. For cancers in a body organ, an isotope such as radioactive iodine is injected into the patient. The doctor will leave the isotope in the body until it has killed the cancer cells. The tracer is then flushed from the body before it can do permanent damage. The person most responsible for the use of nuclear medical procedures is Edith Quimby, an American radiologist. Quimby was the first researcher to accurately measure the amount of radiation necessary to allow body traces. She later determined the exact dosages needed to use radiation as a diagnostic tool. 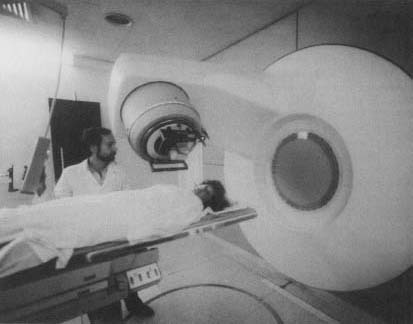 A patient receives radiation therapy. The method of radiotherapy familiar to most people is X-ray treatment. X-ray radiation, however, can only show dense materials such as bone. radiation can be used to sterilize plastic instruments that might be destroyed by steam. In addition, the radiation can reach all areas of an instrument, including small cervices, that traditional steam treatments often misses. What are the differences between radioactive isotopes used for radiotherapy and those used as tracers? For a man of 72 then a PSA count of up to 4 or 5 can be normal with no ceancr. It is likely that after radiation therapy the PSA will go below that level, possibly to less than 1.The key thing is how long it stays that low and whether alternative (probably hormone) therapy is necessary to keep levels down. With a PSA of 7.3 the ceancr is likely to be confined to the prostate and therefore far easier to control. Many more people die with prostate ceancr than from it. Think of it like a disease that needs to be controlled like diabetes.Good luck! how dangerous is iodine radioactive injections to family near the pactient.